For many years, developer Renegade Kid struggled to stay afloat, and after seeing diminishing returns from their new releases, the studio finally folded in 2016, despite a robust catalogue of titles including the Moon and Dementium series, as well as 2D standouts like Mutant Mudds and Xeodrifter. Following the dissolution, founders Jools Watsham and Gregg Hargrove split their IP and founded two separate studios, with Gregg's founding Infitizmo and retaining ownership of the 3D games, and Jools founding Atooi and retaining ownership of the 2D titles. The first new game announced by Atooi is Chicken Wiggle, starring an odd partnership between a bird and his wiggly worm friend, which he keeps in his backpack (but not as a snack). 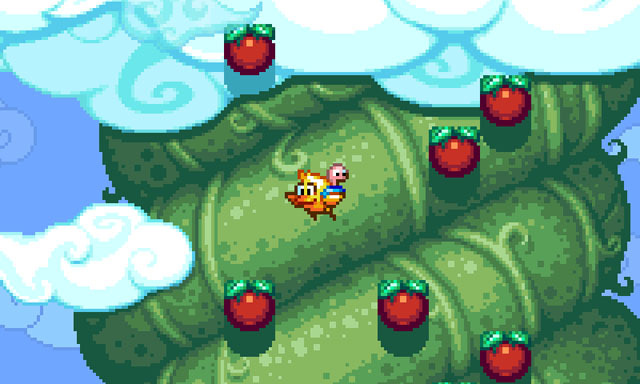 The worm is able to stretch out and reach grapple points and zip to them, as well as smack enemies to stun them, while the bird hops about to navigate the environment and complete platforming challenges. In addition, players are invited to create their own levels and share them online, with new elements unlocking once the player completes the single player campaign. The game is now available for 3DS via Nintendo eShop and is also planned for iOS.